Schlumberger-SEED and the World Wide Workshop are pleased to offer, for the first time: My Science Life - a social network and virtual program for learning how to design and develop Animated Illustrations, Interactive Simulations and Sim Games in Flash. In two initial 2008 pilots, participants are developing projects about Global Climate and Energy. By conceptualizing and creating original animations, sims and games to teach others about these topics, they deepen their own knowledge. Develop important livelihood skills in researching, project planning, scheduling, communication and team work. One unique aspect of the MySLife program is that it is completely virtual. Students and teachers from SEED schools in Trinidad, Malaysia, Saudi Arabia and Russia have joined Schlumberger volunteers from all around the world in a unique online learning community. Almost every continent and time zone is represented! Participants come from very different backgrounds and have a wide range of skills, including technical and English proficiencies. Because of this unique global collaboration, the program is not like a typical school course! There IS NOT a traditional instructor who runs the show, giving out assignments and grades. Instead there is a Facilitator who is a highly motivated co-learner, completing the course along with the participants. The Facilitator helps to foster communication, highlight great work, find and share solutions, and generally inspire and help the group along in their self-learning. A facilitator from the World Wide Workshop models the role, but everyone can join in! FOr instance, SEED volunteers from the first pilot are mentoring new students in the second pilot. It is a Collaborative Social Network: everyone contributes as a learner and facilitator. Like all Globaloria networks, MySLife uses a wiki and webiste as a unique learning platform. The wiki provides the learning community with a personalized, virtual communication and collaboration space that is accessible and customizable from any location, at any time. It contains a detailed Syllabus and a comprehensive set of topics participants can use to develop their animations, sims and sim games. It is an interactive forum and everyone is encouraged to add to and modify it. Each person starts by creating a User Profile page about themselves, and later adds other pages for assignments, project ideas, and works-in-progress. Community members share, review, and comment on one another's contributions. This creative and collaborative virtual space can only be used and managed by SEED registered members, for as long as they wish. It's all about life-long learning. 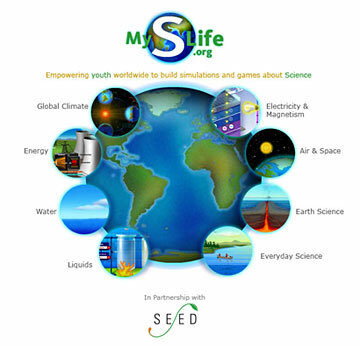 The MySLife Global Climate Website offers a comprehensive set of tutorials, tools and resources to help learn fundamental design, programming and project planning skills for use while building original animated illustrations, interactive simulations, or sim-games -- simple or complex, small or large. This 'Starter Kit' website also features a Community Blog and an links to the Discussion Groups, where participants share, collaborate and communicate in a Web 2.0 style. It's all about facilitating communication and sharing knowledge bottom-up, top-down and peer-to-peer.